Since there are so many ringtone makers on the Internet, you may feel confused which one is the best program to create ringtones on Mac. To help you save time and efforts, here we’ve collected 6 best ringtone maker for Mac, so that you can choose one that fits your demands best. 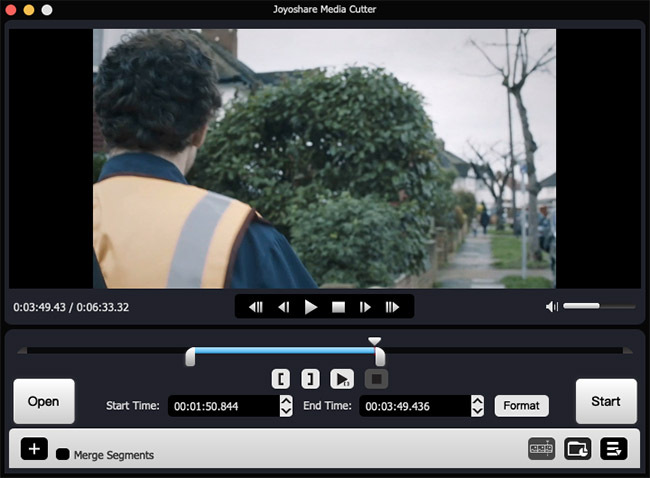 The first best program introduced here is Joyoshare Media Cutter for Mac. It is not only a video cutter and editor, but also an audio cutter joiner and editor. With Joyoshare, you can easily to cut any large audio file into smaller one, remove the unwanted parts of the audio and join the audio clips from the same source together to generate a new one. Besides, you can also adjust the volume and weighting of the audio file, add special sound effects to the audio, extract audio from video, etc. Thus, it can be used to create ringtones for you phone or pad, etc. It’s worth noting that Joyoshare Media Cutter for Mac supports lots of audio file formats including MP3, WAV, WMA, AAC, AC3, OGG, AIFF, RA, M4A, M4B, M4P, M4R, MP2, MPA, MKA, RAM, APE, FLAC, AA, etc, so that you can use any media file in different formats to become a ringtone. Besides iPhone, iPad and Android generic, you can also create ringtones for Windows Phones, Blackberry, Motorola, LG Optimus, etc. As one of the best ringtone converter tools, 4Media Ringtone Maker for Mac allows you to create a ringtone from your favorite songs or extract audio tracks from video files with ease. 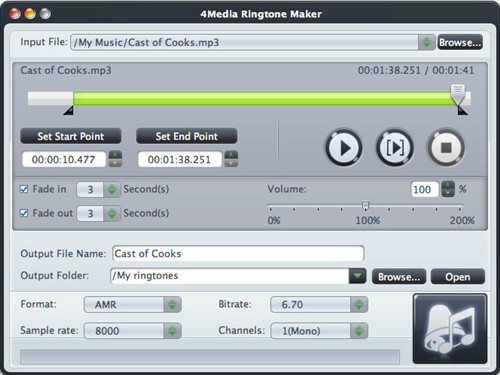 The Mac ringtone maker supports plenty of input and output audio formats such as MP3, WAV, M4A, M4R, OGG, AMR, etc and video formats like AVI, MPEG, MP4, WMV, DivX, H.264/AVC, MKV, MOV, AVCHD, RM, XviD, 3GP, and more. With it, you can convert ringtones for iPhones, Windows Phones, Google phones, BlackBerry, Sony Ericsson, Nokia, Motorola, LG, HTC, etc. Aiming to create ringtones for mobile phones on Mac, this powerful ringtone maker lets user record any sound for ringtone, trim it as you like, add fade in or fade out effects, and adjust output ringtone parameters such as sample rate, bitrate, channel and volume, etc. The Mac ringtone creator allows you to make ringtones of different file formats including MP3, AMR, OGG, M4R, WMA, WAV, M4A, etc for many different phones like iPhones, Android phones, Windows phones, Nokia and other mobile phones. 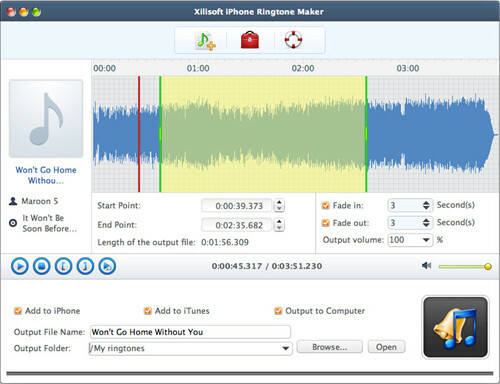 Xilisoft iPhone Ringtone Maker for Mac is a simple-to-use Mac ringtone creator for iPhone users. The software allows you to convert music, songs, voices and other audios or even movies to ringtone. It supports many audio file formats such as MP3, WAV, WMA, AAC, CDA, OGG, FLAC, etc, as well as a wide range of video formats including MP4, AVI, MPEG, WMV, MOV, FLV, MKV, M4V, VOB, H.264/MPEG-4, DivX, XviD, RM, RMVB, etc. You can also add fade in and fade out effects to enhance your ringtone. After ringtone is made, you can freely transfer it to your iPhone or iPad and set it as ringtone. 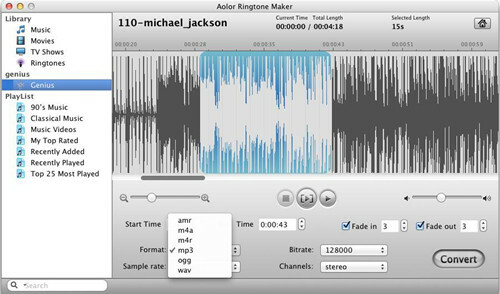 This iPhone M4R ringtone maker is specially designed for creating ringtones for iPhone/iPad/iPod touch users on the Mac. This program allows you to trim and clip an audio file or video to keep the segment you desire and convert it to iPhone ringtone. You can also set fade in and fade out timings, and adjust the ringtone parameters. Moreover, the built-in player will offer you a pre-listening chance before converting it. It can convert many popular media formats like WMA, WAV, RA, M4A, AVI, MPEG, MP4, DivX to iOS gadget ringtone in M4R. 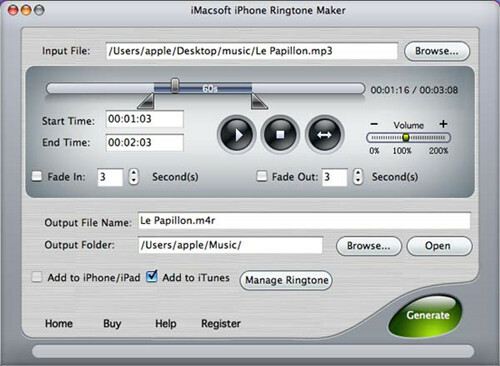 This is another useful Mac iPhone ringtone maker that allows you to customize ringtones very easily. You can create ringtone from your own music or extract audio from beloved movie, etc. In addition, you’re enabled to apply fade-in and fade-out effects to make it smooth. The audio waveform is always shown for a precise trimming and the built-in audio recorder provides an easy recording. 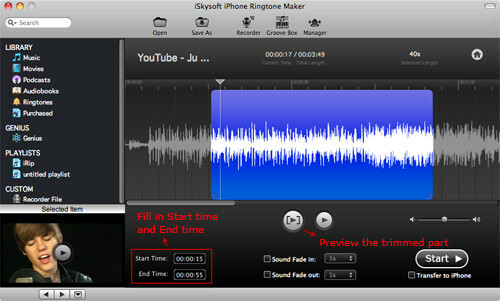 iSkysoft iPhone Ringtone Maker offers you three easy methods to export your polished iPhone ringtone. You can directly transfer it to your iPhone, save it to the local folder of your Mac or save it to iTunes. There are many ringtone makers for Mac in the current market, and here we just pick up 6 best of them, with their advantages and disadvantages included. If you’re seeking for a powerful ringtone creator that can make ringtone for many other different mobile phones, you can consider Joyoshare Media Cutter, 4Media or Aolor; otherwise, if you only want to convert audio to your iPhone ringtone, just try Xilisoft, iMacsoft or iSkysoft. Hope you have a pleasant ringtone making experience!